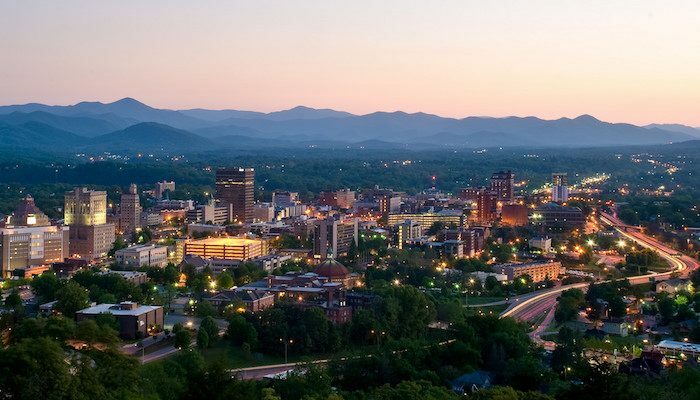 The small city of Asheville, tucked into the Swannanoa and French Broad River valleys of the Blue Ridge Mountains, is famous for its colleges, breweries, and adventurous, outdoor-oriented, environmentally-conscious locals. There are fantastic options for running in Asheville, as well as boundless trail running owing to the beauty of the surrounding mountains. 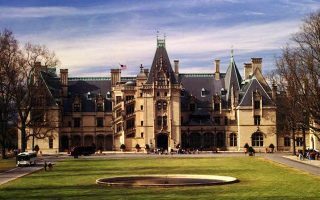 Some of the in-town highlights include the Asheville Urban Trail, the inspiring residences of the Montford neighborhood, and the riverside paths of the French Broad River Greenway. The top outdoor destination in Asheville is probably the Bent River Greenway, which has lots of great running options. 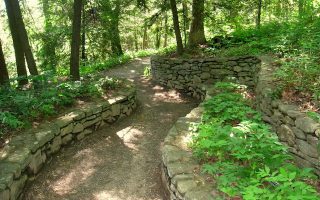 We also love the gardens of the Biltmore Estate, the pastoral paths of Warren Wilson College, the jogging trail at Fletcher Community Park, and the loop around Beaver Lake. 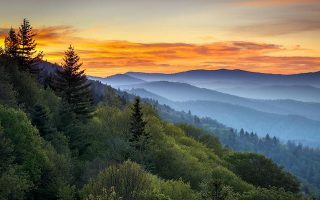 We’ve also included a few trail running highlights, but note that there are extensive options in the Asheville area, such as in the Pisgah National Forest, on the Appalachian Trail, and Great Smoky Mountain National Park. And if driving the famous Blue Ridge Parkway, there are some opportunities to enjoy the area on foot as well. As for getting around, a car is an almost must, although a trolley loops around downtown, and the ART Bus System extends through Asheville and to Black Mountain. 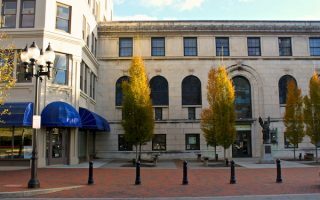 This 1.7-mile self guided tour of downtown Asheville’s architecture, history, and art, covers some of the hippest streets in town, all on spacious sidewalks. 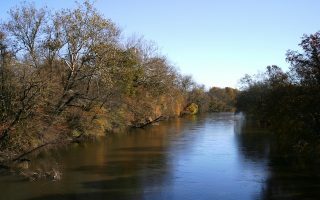 Spanning from French Broad River Park through Carrier Park and ending at Hominy Creek River Park, the French Broad River Greenway is a 2.7 mile asphalt multi-use path following Asheville’s most major river. 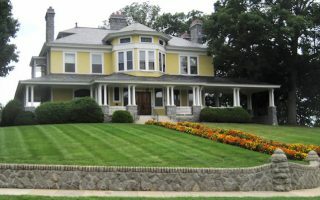 The Montford Historic District of northwest Asheville is a great choice for a tour of some of Asheville's prettiest streets and homes. Starting from the Asheville Visitors Center, an out and back is about 3 miles. Add or vary using side streets. 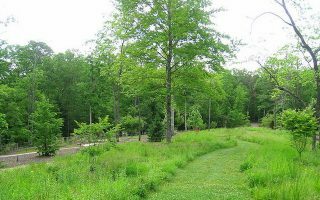 A 3.8 mile paved out and back follows Reed Creek from Pine Points to the University of North Carolina Asheville campus and botanical gardens. This lovely jogging trail forms a part-asphalt, part-dirt loop around Beaver Lake and the surrounding neighborhood. Nice water and mountain views. This beautiful chateau, with gardens and grounds designed by Frederick Law Olmsted, has over 22 miles of trails lining the French Broad River and surrounding forests. 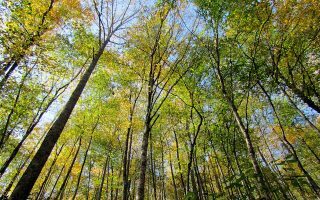 This top outdoor destination in Asheville has a variety of trails from easy to challenging, including a series of dirt Forest Service Roads. Start at the North Carolina Arboretum or Lake Powhatan Recreation Area. Part of the Pisgah National Forest. The 5 mile out and back of Warren Wilson College’s River Trail covers pastoral meadows and farmland with lots of swimming opportunities. Add on with a jaunt around the pretty campus of this small liberal arts college. A 1 mile jogging loop around shady Fletcher Community Park, can be combined with the Cane Creek Greenway for more mileage. There is also outdoor exercise equipment for strength training. A great destination run 25 miles west of Asheville. This popular recreation retreat and conference center has a paved path that encircles the lake. 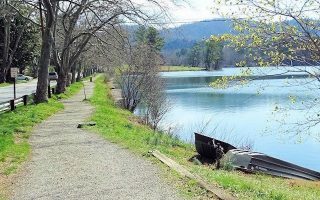 There are loop options of 2.3 and 3.8 miles, with lovely lake and mountain views. A challenging trail run in this area 30 miles south of Asheville. 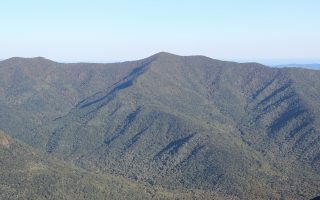 The 10 mile loop up Black Mountain features incredible views of Pisgah National Forest. Popular with mountain bikers, too. A tough trail run up to the summit of Greybeard Mountain and over the Seven Sisters range. 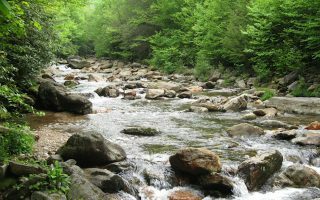 The beautiful Snooks Nose Trail is part of Asheville’s tough 100 mile spring trail race. There are good, challenging 4 and 8 mile out and back routes that will challenge trail runners in their own right. America's most visited National Park is 70 miles west of Asheville. 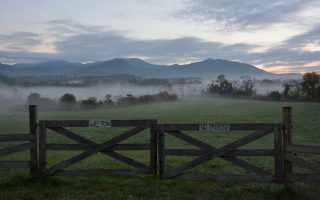 Two good running options are the Cades Cove Loop Road, and the Greenbrier Cove area. Ashheville has great running weather. The altitude keeps the area a bit cooler in summer, with averages a good 5-10 degrees cooler than other parts of the state. Still, average highs are in the mid-80s in summer, though nights are more comfortable. Fall is gorgeous, with a long period of mild weather and gorgeous colors. Winters are cool, with average high temperatures near 50F (8-10C), and lows a bit below freezing. There can be occasional snow and ice. Spring arrives by March and is gorgeous. Precipitation is evenly spread throughout the year. 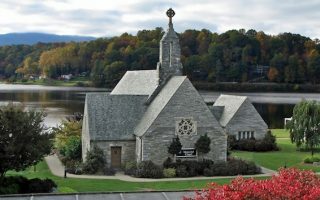 Go to exploreasheville.com for lodging and more. Asheville has many running stores to choose from, all of which have group runs. All helped provide valuable route information for this guide! For additional group running, check out the Asheville Track Club and the Asheville Running Collective. Also see Ju’s Running and Fleet Feet above. Area running calendar, courtesy of FootRx. 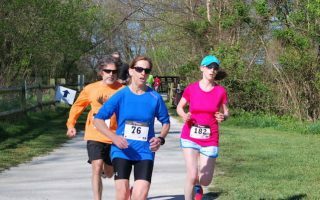 The Asheville Track Club has a great list of upcoming races.